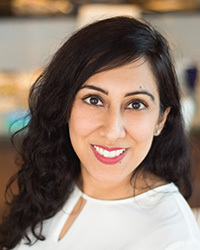 Dr. Deepa Rupani, DMD, is a general dentist who strives to provide her patients with superior dental care through education and a personalized approach. She graduated from Rutgers School of Dental Medicine at the top of her class. Dr. Rupani has provided excellent treatment and comprehensive care to a diverse patient population in the New Jersey area. Dr. Rupani is trained in preventative, restorative and cosmetic dentistry as well as Invisalign and root canal therapy. Additionally, she has performed many pediatric dentistry procedures, including pulpotomies and space maintainers. Our patients often commend Dr. Rupani’s ability to clearly explain their treatments and they appreciate her advice on how to improve their oral hygiene and overall oral health. Outside of dental work, Dr. Rupani enjoys spending her time with her 1½ year old daughter.